In the NHL and NBA, fans in every city get to see an opposing team at least once per season as teams in opposite conferences play a home-and-home series each year. One criticism of Major League Baseball is that fans in some cities will go years without seeing a star from the other league in person. That brings us to Friday's interleague opener from Wrigley Field between the Angels and Cubs. The Halos haven't played there since 2016 and just a couple of times this decade, thus depriving the Cubs faithful of seeing Mike Trout much. They might not get to see the best player of his generation this weekend, either, as Trout left Tuesday's matchup because of a right groin strain. Trout is being called day-to-day but is likely going to miss at least Friday, and naturally the Angels are going to be uber-cautious with the highest-paid player in the history of the sport. Trout was named AL Player of the Week on Monday and is off to another MVP-caliber start in hitting .406 with five homers, 12 RBIs and a stupid .592 on-base percentage. Needless to say, his potential absence would affect any line this weekend. Per usual, the lone matinee of Friday (2:20 p.m. ET) and shown on the MLB Network. 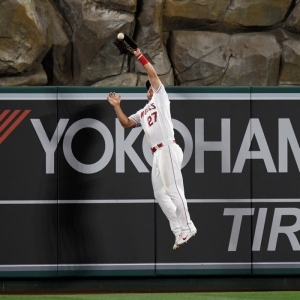 The Angels lose the DH (maybe they could have hidden Trout there). The last thing the Cubs needed was their lone good starting pitcher thus far, Jon Lester, landing on the injured list but he has with a hamstring strain. Not yet clear how long Lester will miss, but the Cubs hope just a start or two. It's lefty Tyler Skaggs (1-1, 2.45) for the Angels. He held the Rangers to one run on five hits last time out to get his first win since last July. The only Cub to have faced him is Anthony Rizzo (0-for-3). Cubs lefty Cole Hamels (1-0, 5.73) wasn't good in his season debut in Texas but had a quality start in Milwaukee last Saturday. He has plenty of experience vs. the Angels from his Rangers days. Albert Pujols hits .216 off him with three homers in 51 at-bats - Pujols would have to supplant Justin Bour at first base to play in this series. Key trends: The Angels are 1-10 in their past 11 road games. The "over/under" is 8-3 in Skaggs' previous 11 in a series opener. Early lean: Only a few position players in MLB will warrant a TBA. Trout is one. Bet Cubs on runline if he sits. It was a no-brainer for the Yankees to re-sign J.A. Happ this offseason with how good he was in pinstripes after coming over in trade from Toronto last season. Alas, Happ (0-1, 6.48) hasn't looked the same thus far, yet to last more than 4.1 innings in two starts. Both were against Baltimore, not exactly a powerhouse lineup. Happ, who is from outside of Chicago and went to Northwestern, won his lone start vs. the White Sox last year but allowed four runs in 5.1 innings. Tim Anderson is 6-for-10 off Happ with a homer. Chicago's Lucas Giolito (1-1, 5.73) was good in his debut in Kansas City then roughed up last time out vs. Seattle. Par for the course for him. No Yankee has more than three at-bats against him. Key trends: The White Sox are 1-7 in Giolito's past eight. The over is 5-0 in his previous five. MLB Network prime-time game. With Mike Foltynewicz sidelined due to injury, the Braves needed young lefty Sean Newcomb to step into the ace role, and he has with a 1.64 ERA in two starts, albeit without a decision. He's 2-2 with a 1.82 ERA in six career starts vs. the Mets. Amed Rosario is 3-for-7 against him with two doubles. Michael Conforto 0-for-4. New York's Zack Wheeler (0-1, 10.24) is probably glad to be not facing Washington again as he has surrendered 11 runs and eight walks over 9.2 innings in two against the Nats to open 2019. The Georgia native is 2-2 with a 3.41 ERA in five career starts in Atlanta. Freddie Freeman kills Wheeler, going 10-for-19 with three doubles and two homers. Key trends: The Mets are 7-2 in Wheeler's past nine vs. the NL East. The over is 5-0-1 in his previous six on the road. Early lean: Braves and over. Rematch of the 2018 NLCS. It's expected to be the final start for Dodgers lefty and one-time mega-prospect Julio Urias (0-0, 3.12) before he is shifted to the bullpen at least for the time being - the team plans to limit him to 100 innings maximum after missing most of the past two seasons due to shoulder surgery. Urias was good in his season debut vs. the Giants but lasted only 3.2 innings last time out in Colorado. He is 1-0 with a 1.61 ERA in two career starts against the Brewers. Ryan Braun is 3-for-5 off him. Milwaukee's Corbin Burnes (0-1, 9.90) might be pitching for his rotation spot as he has allowed three homers in each of his first two outings, the first Brewers pitcher in 20 years to allow three dingers in back-to-back appearances. Burnes is from the L.A. area and no Dodger has more than two at-bats off him. Key trends: The Dodgers are 1-5 in Urias' past six at home. The under is 5-1 in those. Early lean: Dodgers and over. Monitor the status of excellent young Astros third baseman Alex Bregman. He left Tuesday's game after feeling some tightness in his hamstring. Those types of injuries tend to happen often in the season's first weeks because guys don't go 100 percent in spring training. Lefty Wade Miley (1-1, 2.31) has gotten off to a solid start as an Astro with one quality start and one coming up an out short. He spent a large chunk of 2016 with Seattle. New Mariner Edwin Encarnacion is 7-for-17 with three homers off him. Seattle lefty Wade LeBlanc (2-0, 4.76) - the first all-Wade matchup in MLB? - has been the beneficiary of double-digit runs behind him in both starts. LeBlanc was 1-1, 6.75 ERA in 6 games (4 starts) vs. Houston last year. Jose Altuve is 4-for-8 against him. Key trends: The Mariners are 17-4 in LeBlanc's past 21 at home. The under is 6-1 in his previous seven series openers. Early lean: Mariners and under. Doc's Sports is offering $60 in member's baseball picks - no obligation, no sales people - you don't even have to enter credit card information. You can use this $60 credit for any of our top MLB handicappers. Get $60 worth of premium members' picks free. Also, for a limited time only get three MLB handicappers for the price of one. Click here for details . Get free MLB picks daily on Doc's Sports homepage.